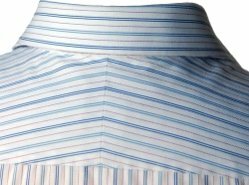 The yoke is a strip of shirting (or cloth) that stretches across the top back of a shirt as shown below. When someone checks you out from behind, it is the first piece of cloth eyes are laid upon. Therefore, it is imperative to give a good first back impression. It iconforms to our shoulder gradient and uses it like a thick hanger, draping the front and back of the shirt over our body, creating an elegant and beautiful shape and flow to the garment. owever, if it is not constructed to the shape of our shoulders, the shirt will tend to bunch in the middle of the body, creating a pinched effect that looks unpleasent. When you consider all three dimensions, the human shoulder is more complicated than it might seem to the layman. Every person has a unique shape. The z-axis or line through the screen is how bent the shoulders are towards the front or back of a person. A sloucher or humpbacked person would be leaning towards the front, whereas a person working in the military would lean his shoulders towards the back. A tailor would have to consider all the above before creating the pattern. Yokes are double layered is because they need the weight and thickness to hang over our bodies properly. This is similar to the padding used in jackets. If too soft, the shirt will tend to droop, creating a lazy look on the wearers back view. The double layer construction gives more straightness and height to the wearer. The single is most commonly found on common store bought shirts. A piece of cloth is cut from the same material used to make the rest of the shirt, and sewed together. This looks more simple and clean than the split. It is mostly recommended for solid colored shirts. On striped shirts, it appears to wrap the shoulders and give a illusion of you hunching forward. The split yoke is almost always a sure sign of a quality shirt. Splits also allow more fancy and unique designs to a shirt. Stripes and checks are chevroned or angled at about 30 degrees to give the shirt a more detailed and fanciful look. Another important reason is that the upside down V shape allows the stripes and checks to be aligned and matched with the sleeves. This creates a cleaner and more dignified detail that suggests more expensive work.